Atwill Media loves to focus on our community of hard-working business owners. We check in on you to see how you're doing, walk you through every step of the website setup process, and are always there when you need us. Another way that we try to give back to our community is through helpful tips and tricks for your business. We like to call them marketing tips. 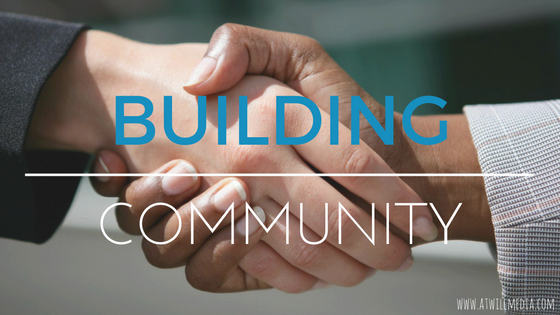 So, how do you build a strong community around you? We've got some great marketing tips in today's blog post that will help you out. The first thing you need to realize is the difference between offline and online communities. Your offline community consists of people who you come in contact with every day. They shop at your store, they have conversations with you, and they tell others in the community about you. Your online community consists of people on various websites and forums who give you good reviews, share your blog posts and website URL, and tell others online about you. If you have e-commerce setup, they're also the people who bring customers to your website to shop. When you start to build a community, you want to begin by focus on a small group of trusted people. These are people who were maybe some of your first customers, or some of your long-standing customers. People who are going to shop at your business no matter what. Eventually, these people will transform into what is known as business advocates. They are the people who will preach the good news about your business to their friends, family, and coworkers. They'll bring other people to your business, and help build your offline community. Social media is the key to online community. It's where everyone is, and what they're continuing to move toward. If you own a business today and you don't have some sort of social media account for your business, you're severely behind the rest of your competition. Social media is meant to be used as a tool for growing online community. Facebook makes it easy for you to create Business Page where customers can send you direct messages, leave reviews, comment and like your updates, find vital info about your business, and more! Similarly, companies like Instagram, Twitter, Pinterest, and Snapchat connect you with your customers easier than ever before. Opinionated customers have things to say about you. You want to listen to what they have to say because it builds a bridge of trust between you and them. That's one of the reasons why encouraging your customers to share their opinions about you is so important. You need to get feedback from them in order to feel like you're really connecting on a more personal level. Encourage your customers to share their opinions, and watch as your sense of community with them grows bigger and stronger. Does your hometown have festivals or events that encourage community involvement? Can you sponsor one of these events in some way? Whether it's a BBQ festival, or a city theatre production, sponsoring an event in some way gets your name out there, and at the same time shows your community that you are focused on supporting them in the same way that they support you. Building a community of people around you is a great way to build on the success of your business. Don't be afraid to step out and make friends with the loyal customers that surround you every day!